The ancient man had been so fascinated with flight that arts and literature of the previous ages are replete with accounts of people attempting to overcome gravity and imitating the birds in the sky. History narrates how this dream was materialized, starting from Da Vinci, to the Wright brothers, up to the modern day airplanes, which are one of the most common modes of transportation today. Indeed, humanity has touched the sky. We may not have wings like the birds, but we have proven that we are capable of flight. A similar dream of flying ignited in the hearts of several chemical engineering majors in the University of the Philippines Diliman way back in the late 1990s. These students, united by a common set of values that they uphold, saw the need of the department for an organization whose main goal is to help their fellow ChE majors with their academic and holistic growth. And so they took a giant leap in an attempt to accomplish their dreams of flying. They established the University of the Philippines Academic League of Chemical Engineering Students (UP ALCHEMES). Joel Tarongoy, the first acting-president of the newly-conceived organization, shared the story of UP ALCHEMES’ genesis. Several batch 1996 (and 1997) ChE students saw the need for an organization that aims to support ChE students in their growth and development, with a strong focus on academic excellence, which sometimes gets relegated to the background. Academic excellence was intended to be a key differentiator for ALCHEMES, hence the emphasis on putting “Academic” in the organization’s name. Things, however, did not stop there. The first Alchemists endeavoured to have the org recognized by the college. On the 13th day of January 1999, after going through numerous papers and documents, College of Engineering Dean Edgardo Atanacio signed the Certificate of Recognition for the org, rendering UP ALCHEMES as an official student organization in the College, with 60 founding members. Teofilo Garcia Jr. led ALCHEMES on its first year as a college-recognized organization. That was just the beginning of ALCHEMES’ take-off. Eighteen years after, it can be seen how their giant leap successfully launched them to flight, as UP ALCHEMES is now soaring like an eagle. Eagles, despite their reputation as the conquerors of the skies, started humbly as eaglets incapable of flight. Just like all young birds, their frail body frames cannot support them, rendering them flightless. UP ALCHEMES was inaugurated in a similar fashion. Being a newborn organization was not easy for the pioneering batch of Alchemists. Org recognition was like going through the eye of a needle. Joel Tarongoy tells the story of their hardship. Recognition as a new organization especially from the College/Department was one of the key challenges for UP ALCHEMES as one of the requirements is having a faculty adviser from the College. It was difficult to get an adviser from the ChE. In fact, we first received University recognition before CoE recognition, and our first adviser was from the E&S department. It was only after a few semester before we were able to get an adviser from the ChE department. Accreditation was not the only predicament of the early Alchemists. Resources and finances were also barriers to them. Since the org culture back then in the College was harsh, ALCHEMES started without an official tambayan. The members usually huddled behind the Yakal Dormitory with their dilapidated benches just so they can have fun and bond with each other. The org, moreover, had trouble making ends meet, since the funds coming from the membership fee was not enough. They even had to borrow money from their advisers so that they can participate in Engg Week events. We received little support to push through, and in fact faced a fair bit of discouragement. At one point, during a PIChE engagement, we were asked to reconsider having a second organization within the department to promote unity and avoid creating factions within the ChE community. It was a good thing that the early Alchemists did not easily give up when confronted with those pressing circumstances. They understood that all great things spring from humble beginnings. They viewed the setbacks as challenges that they needed to overcome, and this motivated them when they sat down and drafted the mission and bylaws of ALCHEMES. Those are the chronicles of the early attempts of the org to span the sky. And as an eagle gradually learns how to fly, UP ALCHEMES eventually began to flap its wings and soar. 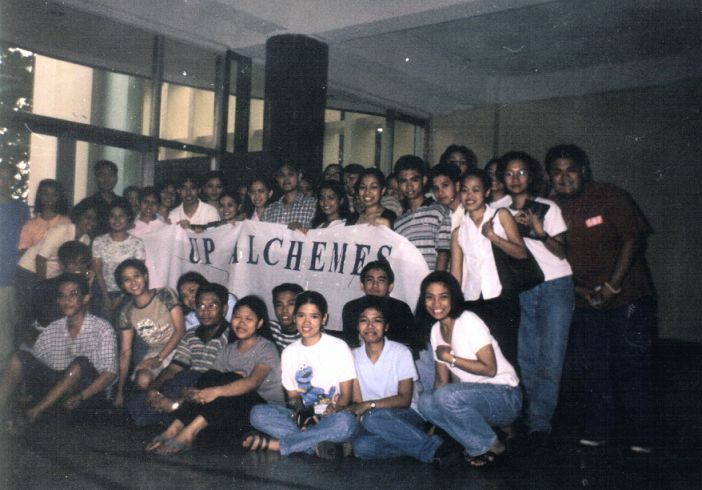 Alchemists at the Sunken Garden for a General Assembly (year 2000). The Melchor Hall lobby saturated with the pioneering batch of Alchemists. What established the eagle as the “King of the Sky” is the solidity of its character. There is a certain cadence with the way the eagle whips its wings, a cadence that signifies authority. And the eagle’s eyes – fierce yet sincere – are fit for a species called “King”. The totality of the eagle’s character, its core attributes, affirms its superiority above all flying creatures. Just like an eagle, what sets UP ALCHEMES apart from other orgs in the College is its roster of core values. The founding members did not aggregate because they desire to form a large organization which will host gigantic events and bag numerous accolades. That, for them, must have been secondary. They decided to conceive ALCHEMES because they want to gather like-minded individuals with a heart for service, humility, academics, professionalism, and excellence. These five traits, also known as SHAPE, make up the org’s core values, the Alchemist’s DNA. Now, SHAPE is what differentiates Alchemists from the rest. The mark of service is evident in all of ALCHEMES’ events and programs, most notably ChEER UP Pinoy, a community development-oriented project. The number of Latin honor graduates and board topnotchers from the org show how Alchemists put a prime on academics. Alchemists who serve in the various student councils of the University affirm the unwavering professionalism and work ethics imbibed in the org. Moreover, the awards and recognitions received by UP ALCHEMES and its members, be it college-wide, university-wide, or nationwide, tell us again and again how Alchemists strive to be excellent in their every endeavour. Despite all these things, however, Alchemists keep their feet rooted on the ground. As what Julie Zarene, a UP ALCHEMES alumna, told the members: “while it is important to be proud Alchemists, we should also seek to be humble Alchemists”. After all, humility is more than just a part of the org’s core values – it is a prerequisite for a more peaceful world. Now on its eighteenth year of flight, UP ALCHEMES has already reached heights which seemed unreachable before. And as it continues to soar, it constantly encounters barriers and mountains which seem to get higher and higher every time. Alchemists, however, press on forward, undaunted by the barricades. What is commendable about this org is that it never ceases to grow. There might be dark nights and storms along the way, but Alchemists always make it through, together as a family. Peter Nicholas Onglao, the UP ALCHEMES President for A.Y. 2017-2018, tells us about the plans of the Executive Committee for the upcoming year. On its 18th year, UP ALCHEMES will focus on bringing Alchemists even closer together, with more bonding moments and internal competitions. By putting a prime on our members, the improvement of our events and other endeavours will simply follow. Through its events and its core values, UP ALCHEMES hopes to serve different communities nationwide using science and technology. Through its recent incorporation, UP ALCHEMES hopes to make more long-term corporate partners this year. It is our goal that after this year, UP ALCHEMES will be able to improve its service projects within and outside the university, while also improving its internal structure, ensuring that future Alchemists will still be able to make a difference and break free. Finally, Peter left a message to the Alchemists. Alchemists, expect to be accountable this year. In our efforts to prevent member burnout, we will put a prime on proper task delegation, such that each member has an important role in the organization, and is accountable for certain aspects of it or its events. With this, we expect all members to work hard, and to dedicate themselves to their assigned tasks. However, don’t expect ALCHEMES to be all work and no play. We will also arrange semstarters, semenders, and midsem bonding sessions. We could have film showings, game nights, and other activities at your request. In order to fulfill all of our goals this year, we simply ask that all of you stay RESPONSIVE; COMMUNICATE all your ideas and comments to your heads or to the Executive Committee. Whenever you feel overworked, we will act as your support system. We will focus on the improvement of member welfare, because you guys are the lifeblood of the organization. UP ALCHEMES is nothing without you and your efforts, and the Executive Committee pledges that we will do all that we can to take care of you and give you avenues of growth this year. Let’s make UP ALCHEMES great again! UP UP! The story of Daedalus and Icarus is probably one of the most famous myths related to flying. The conclusion of the story, however, is tragic, since the pair of wax-based wings that Icarus wore melted as the curious boy soared higher toward the sun. Miserable this story might be, may this not hinder Alchemists from soaring higher. Yes, it is risky, even detrimental, to sail uncharted waters, but that is how treasures are discovered. The founding members must have felt scared and uncertain when they established the org. They took a risk. And look at what their risk resulted to: UP ALCHEMES. The 18 years of this org’s existence is an iteration of taking chances, making mistakes, falling, and rising up again. So to Alchemists out there, continue soaring higher. And if you get too close to the sun, and fall down to the ground, pick yourself up.